In our curriculum, we code our learning activities for preferences of different learners—Visual, Auditory, and Kinesthetic. If we were to try and focus on every single type of learner in every single moment, we would never be able to teach anyone anything. However, if we compare and contrast their learning styles, we can better understand how each of these learners develops their understanding of the content we’re trying to teach them and vary up our classrooms so each student has a chance to gain insightful knowledge. Below we break down the three main learning preferences, and how teaching in another style will best serve a particular preference. A student who prefers the visual learning style doesn’t just want pictures to accompany the learning. They need graphic organizers to help them process and categorize information because they have a hard time arranging words in their heads/”in the ether.” Rarely can a visual learner process information with a lot of noise around them. Helpful tools for visual learners to synthesize information include drawing columns on the board, using Venn diagrams on pieces of paper, or printing icons in a table can help these students synthesize information. Having students read blocks of text with no accompanying pictures or writing a short paragraph about a particular topic can be tortuous to the student who prefers visual learning. Asking them to depict a feeling or choose from amongst a preset group of photos will allow them to communicate much more clearly. Finally, if you give them several instructions without writing the instructions down or on the board, you can expect the visual learner to forget or completely miss some of your rules. This may seem like an obvious statement: auditory learners need to hear things. But, this piece of information will make you much more successful when you recognize that auditory learners may talk a lot—including narrating what they’re doing. Whereas some students may look perplexed when you try and use the Socratic method of teaching—asking questions to promote dialogue—auditory learners will most likely jump in without hesitation. Auditory learners will most likely capture every word that is said. For this reason, giving instructions should be deliberate. Do not be surprised if it seems like they “cheated,” because they will be able to identify the loopholes in your instructions very well. 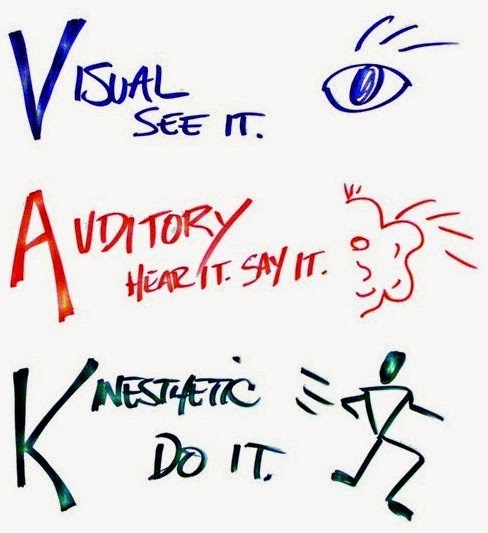 Visuals can help them learn, but you must be careful that any sort of learning aid, or movement from the teacher, reinforces the learning. If you pace while you teach, the auditory learner may become distracted by your feet clicking on the floor or some other distracting behavior. Kinesthetic learning can take place through many different avenues. Students can move themselves, doing a dance for instance, or students can move objects, arranging a physical timeline with clothespins. These students will jump in when you have a project that requires building something using various materials. They may not be the best at constructing what you’ve asked them, but they will want to be the student literally putting their hands on everything. While all children may be a little antsy after sitting for a while, this learner is almost always moving. You can see their foot swinging in the chair, or their whole body swaying as you stand on the bimah to teach them about the ark. A stress ball or silent toy to fidget with works wonders for this student. Figuring out how to harness their learning style can be the trickiest of the three. Some academics argue that there is a fourth learning preference: reading. Reading can take many forms—are students reading aloud, or quietly to themselves. Is the text the content, or a heading that supplements a picture? We almost always default to teaching and reading instruction in the mode with which we are most familiar. Try to vary up how you go about teaching (and reading), remembering that these learning styles are preferences. No one student is locked into that style forever nor are you as a teacher restricted to one style for the end of time.